Does anyone seal jelly jars with paraffin anymore? 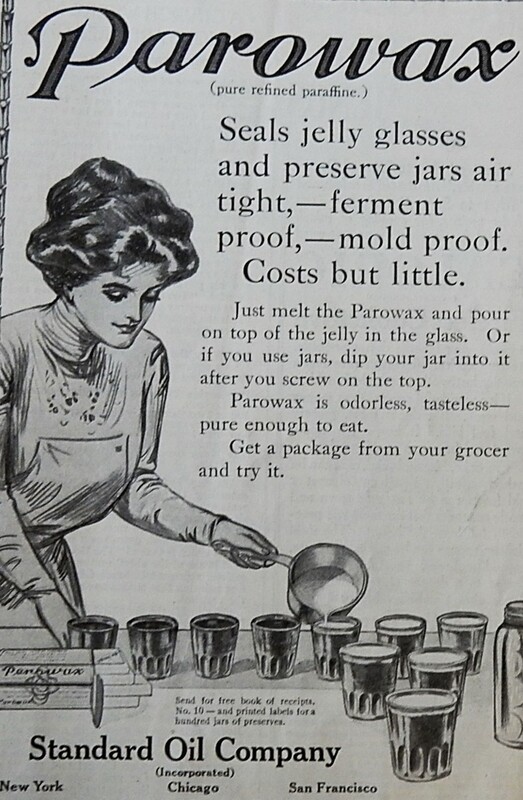 This old Parowax ad reminded me of how much I’ve changed the way I seal jam and jelly jars. I can clearly remember putting wax on the top of jelly jars when I was a young adult – but shifted to using canning lids and water-bath processing years ago. My experience was the same as yours. The parafin was a mess! If there were two molecules of jam on the edge, it wouldn’t seal. I loved the reliability of the metal tops. Thanks for writing about these things. It’s fun to go down memory lane with you. It wonderful to hear that you enjoy this blog. I have a lot of fun doing it. I have similar memories of having fun opening jelly jars when I was a kid. I remember sticking a knife into the paraffin and lifting it out – generally in two pieces. I haven’t done much canning or jelly making, but still find this very interesting. The one year I did participate (lots of apricot jam), we used regular ol’ mason jars with the screw on metal lids. My grandmother used paraffin to seal her jars of jelly. Seeing ‘Standard Oil Company’ in connection with a food item is kind of scary, though. I do remember my mother keeping a paraffin block around for some other purpose, and a paraffin “pencil.” I think that was for helping metal zippers slide more easily. I love your stories of when you’ve recently seen jams or jellies sealed with paraffin. I’m intrigued by the honey and mayhew jelly. It’s sounds just like the type of old-fashioned food that I like to try. If I saw it, like you, I’d definitely leave some money in the jar and buy some – and my family would probably roll their eyes and wonder about safety of it. I do remember it sold in the grocery store. I used to make candles and bought large amounts of wax and yes, the wax is made from petroleum as are many of the things we use in daily life. Most of us have eaten quite a bit as it is added to chocolate candy and it is FDA approved. Higher priced chocolates use less or none. It’s interesting how many ways paraffin is used. I’ve seen chocolate recipes which call for adding paraffin. It is amazing what we eat and don’t know exactly what is in our food. They do not list the wax in candy bars, but it keeps it from melting making our favorite treat more portable and affordable. Your comment reminds me that I used paraffin to make sand candles with my kids years ago. My memory is that I put some damp sand into an empty plastic ice cream tub, hollowed out a circle in the sand, added a wick and poured in some melted paraffin that I’d added a little food coloring to. Yes! I made sand candles too. I was so into candle making, I started buying 10 pound slabs. It’s certainly still quite the thing in France as we discovered when we lived there. Interesting that jars are still sealed with paraffin in France. I don’t remember using wax.I only remember using lids. It’s a fun advertisement. I’m glad you enjoyed the ad. I remember helping can when I was a teenager, and we did use wax. It sounds like your memories are similar to mine. My aunt Annie used to make Sure-gel strawberry freezer jam and place it in jelly jars, then pour on the melted paraffin wax before putting on the lids and placing in the freezer. Interesting – I’ve never made freezer jam, but I hadn’t realized that paraffin was sometimes used with freezer jams. Freezer jams taste like fresh fruit. I can’t stand cooked jams after growing up on freezer jams. Mom just placed the jam in freezer containers, as I do. I should try making some freezer jam. It sounds tasty–plus easy to make. It’s sold as little sticks in hardware stores here in France. It must have both food-related uses and non-food uses if it is sold in hardware stores. Acutally it was in the food preserving section so I think it is still used here! I never did canning, so I can’t comment on that, though I do remember parallax on things I used. There are two things that strike me, though. The illustrations in these ads all look like they come from an earlier period, as they do, yet I can’t figure out why. Is it the hairstyle?, the apron? the artistic method? Also, it strikes me how deeply the oil industry is embedded in our culture. Standard Oil has been around for a long time. I love the drawings that illustrate ads and articles in old newspapers and magazines. There were some incredible illustrators back then –and I think that it was a field that employed women. You have done an amazing job with the blog. I hope you appreciate yourself. And now I understand something else. I have a friend who was once in a game where they had to identify food by its taste alone, with eyes closed. She hasn’t eaten chocolate since, because, she said, it tasted like eating a candle. Interesting. . . I’m going to have to think about what the chocolate really tastes like the next time I eat some. 🙂 Thanks for the kind words. I really appreciate your support. Just love the old language -“costs but little”! It’s interesting to think about how language has changed over the last hundred years. I’ve never used it, but now that I’m reading this I can’t help but wonder if it’s actually healthy. After all, Paraffin is a petroleum product… Maybe that’s why people stopped using it? I do not recall it being as ‘ferment proof’ or ‘mold proof’ as the advertisement would seem to indicate. I can recall my grandmother opening jars of jelly (I think that is the only thing she used it with) that had molded. I do not remember any fermenting of the jelly, but then, I probably would not have known what that was then anyway as I was pretty young when she used paraffin to seal a jelly jar! Your memories are similar to mine. I think that if the paraffin seal was not perfect that the jelly might get moldy. It is still used in many chocolates. I think that the government (extension service) quit recommending the use of paraffin in the 1970s — or maybe a little earlier. My memory is that the main concern at the time was that with paraffin there was more possibility of the jelly or jam spoiling (mold, etc.) than if it was processed in a water bath using metal 2-piece lids. I think that could explain it. Haha, not too much from today’s newspaper ad, just more stylish. I still have a supply of paraffin in my cupboard. Great for making jelly! It’s awesome that you still do it the old-fashioned way. I think that it would be fun to make some jelly and try my hand at sealing it with paraffin. I still have a box in a drawer in the pantry. It’s labeled Paraseal Wax For Canning, 5 cakes total at 16oz. It says it can seal 25 jelly and jam jars and the instructions are on the box. There is also a list for other uses in the home. The sticker says .39 but doesn’t mention Standard Oil. We always used wax up until I was about 13. I last remember using wax a summer I worked as a mother’s helper and I was 16 then. That was 1978. The price sounds right. 🙂 I also think that paraffin become less popular in the 1970’s. I think that maybe the extension service quit recommending paraffin at that time. But it seems to me that even though we started using lids we did not water bath them, just filled them to 1/4 ” with the hot jelly then flipped them over and set to cool. I was just thinking about this the other day. I don’t can anything, but was remembering my grandmother using the paraffin wax. Thanks for your articles and the memories. It’s wonderful to hear that you like A Hundred Years Ago. I really enjoy pulling the posts together. I was around ladies that used paraffin to seal their jellies with, however my Mom canned hers. She was never a fan of using wax. I like reading the old ads and enjoy the artwork too. There were some amazing illustrators back then. It’s nice to hear that you enjoy the old ads. I like them, too. Yup, my grandmother used paraffin on the farm and probably still would, if she were alive today! My mother-in-law used paraffin her entire life. She said that it had always worked for her in the past, so it would still work. I couldn’t argue with that. I did not start canning until I was an adult, so never used this method. I can only imagine how messy it was! The wax was fun to play with when it was cooling and still pliable, if there was leftover.